BTG has developed a novel high gradient (1GV/m) laser-excited pulsed electron gun for use as an injector for advanced accelerator research. This unique system uses a laser triggered switch to control and sharpen the output voltage from a pulsed high voltage transformer. A current pulse of more than 100 kA travels down a 1-meter variable impedance line in which the pulse voltage is increased and the pulse shape is optimized. 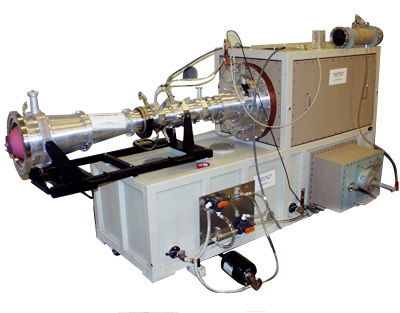 This gun has commercial applications as a tunable tabletop FEL, as a microwave source ( > 10 GHz) or as a flash x-ray source. The new electron gun is designed to operate at energies between 1 and 5 MeV. It will form the foundation for research in Linear Colliders, Free Electron Lasers, Cellular Biology, Molecular Science, Materials Science, and the study of transient phenomena in the sub-nanosecond time frame. It will also be used to study properties of materials in the presence of high fields such as dark current emission and high voltage breakdown characteristics that will provide information critical to the development of high frequency accelerating structures. In addition, using Bremsstrahlung radiation from these ultra short relativistic electrons, the gun is expected to be an efficient source of x-ray photons for imaging transient effects in biological samples, micro lithography and micro machining. These excellent beam qualities will be augmented for the first time by the simplicity and compactness of the device resulting in an efficient, affordable product with superior performance and unique capabilities.